Soaring proudly out of the Aegean Sea with its plunging cliff sides, stunning views, glistening sunsets and beautiful white washed houses, is the Island of Santorini. 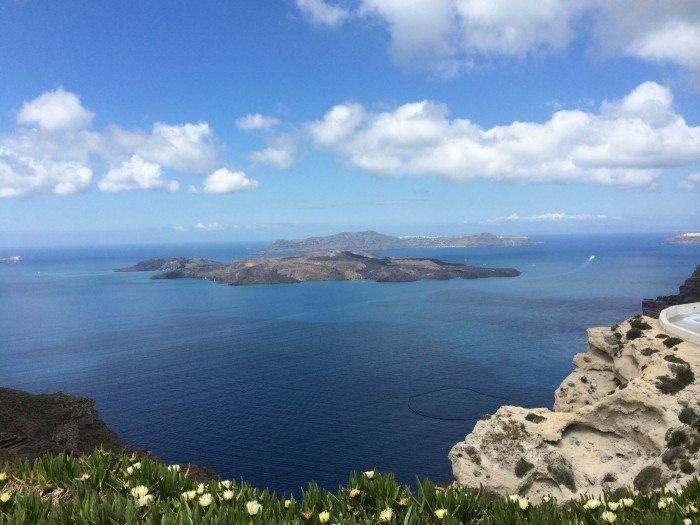 Santorini is part of a cluster of islands that were formed from volcanic eruptions thousands of years ago and is the reason for its jaw dropping landscape. Although this is a major destination for a romantic getaway, it draws crowds of all sorts looking to explore everything the mediterranean has to offer. Clear blue waters, colored sand beaches, calder views, world famous sunsets, nightlife and best of all food that will change your life. The extremely friendly locals and tall dark and handsome men (and beautiful women) are just the icing on top of the cake. 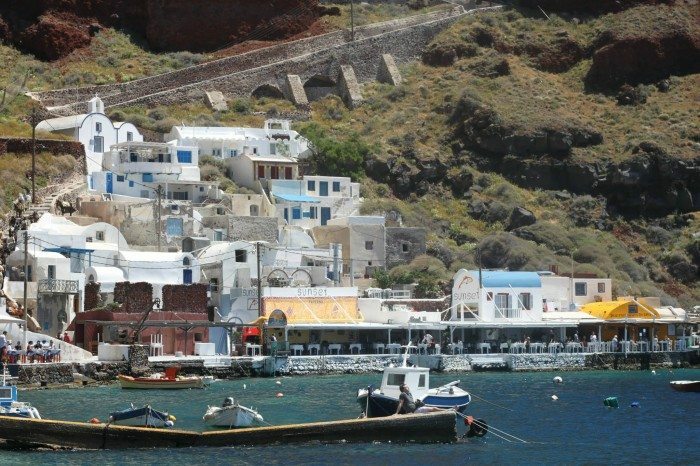 Santorini has so many different areas to explore all offering something a bit different. 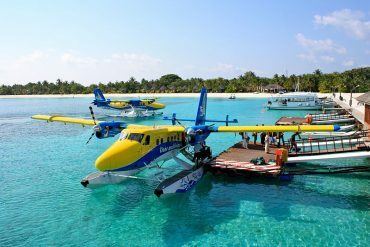 From volcanic beaches, newly discovered ruins, wineries and upscale restaurants and shopping, it’s hard to know where to base yourself and how to get around. The accommodation options are endless and range from budget hostels to rock star prices with million dollar views. But have no fear, because as we discovered after checking into our tip of the island Akrotiri accommodation, all you need is a scooter, quad bike or rental car to give you easy access to all there is to see and do. If the thought of driving in a foreign country is a bit daunting, then just opt for a place to stay that is walking distance to the local bus which will get you to where you want to go. 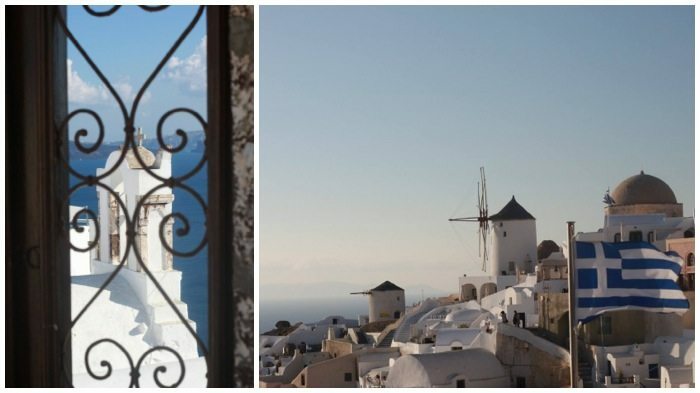 Oia is the biggest tourist draw because this is where the picture of Greece with stark white houses perched cliff side with bright blue dome roofs was made. Spend the day aimlessly wandering the cobblestone alleys snapping photos of the postcard perfect architecture and enjoying views over the island and volcano. 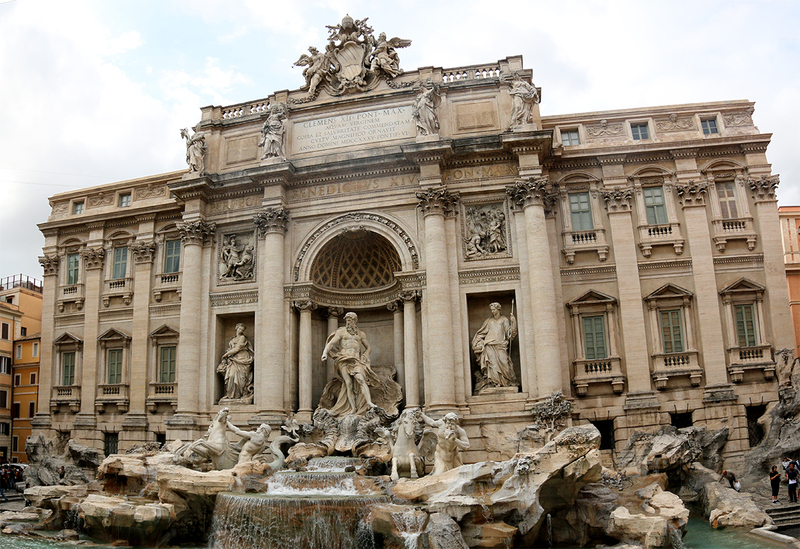 You’ll lose track of time while checking out the array of jewelry stores, souvenir shops, tavernas and bars. Although on the higher end for accommodation and dining, it is also the best spot on the island to watch the sun dip into the sea at sunset. Just follow the crowds to the Oia Castle for a nice vantage point or head out early or make a reservation in order to snag a good viewing spot at one of the many open air restaurants and bars. We stopped into Pelekanos for a drink on their rooftop bar the views and cocktails are top notch while reservations are available for dinner at sunset. Make your way down to Amoudi Bay either on foot, by boat or on your scooter. We cruised across this hidden gem while exploring on our Quad bike. 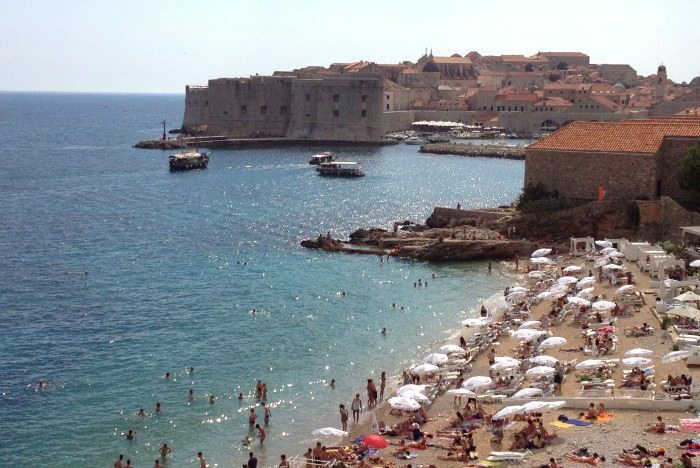 It’s a quaint port where you can dine with the ocean practically lapping at your feet. 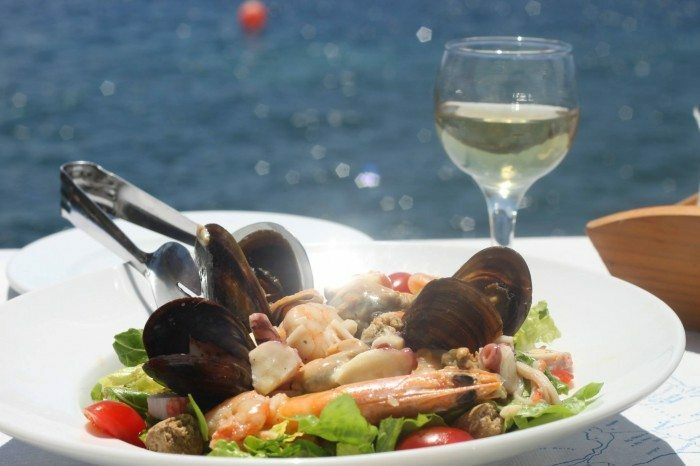 Fresh seafood and spectacular views makes it a must visit. 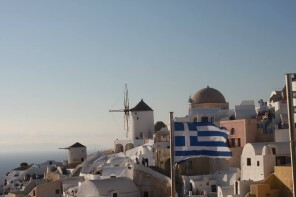 Fira the capital, has more of a city buzz about it with cheaper accommodation options. It draws a bit of a younger crowd for the imitation goods, happening bars and cheap eats. Located basically halfway between the two ends of the Island and not far from the airport, it’s a good spot to base yourself if you want to have some big nights out and have easy access to both the beaches of Kamari and picturesque Oia. 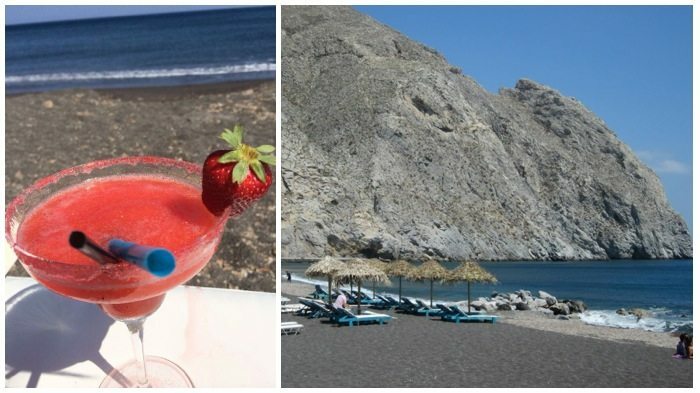 Kamari, Perivolos and Perissa are the more popular beach areas where you can go to relax on lounge chairs, sip cocktails, dip in the ocean or play beach sports. 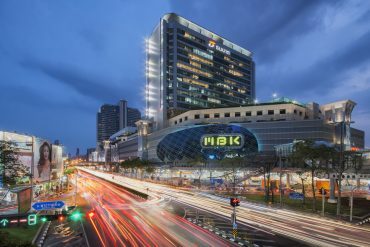 You’ll also find well priced food and hotel options as well as banging nightlife during the peak-season. 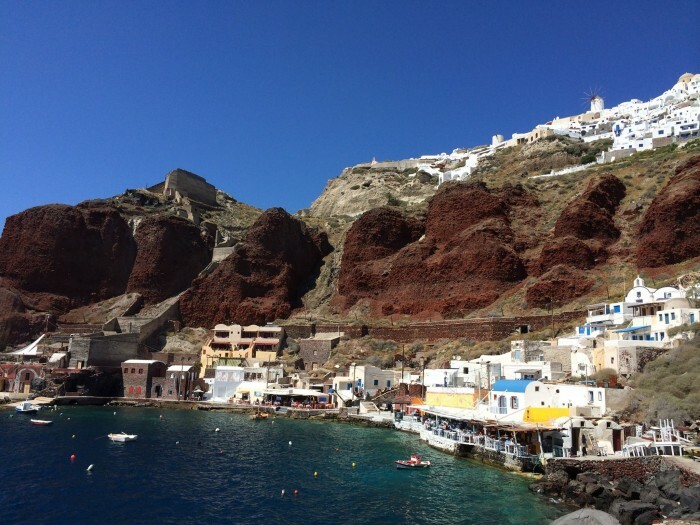 If you didn’t arrive in Santorini by boat then another great way to explore is to take a day trip by boat which will bring you to some great little spots like Red beach and up closer and personal with the Caldera it’ll also give you a different vantage point looking up at the steep cliffs. Akrotiri is located on the opposite end of the island from Oia and offers yet another vantage point to see all of Santorini and the Caldera. More secluded and relaxing, it’s a great spot to avoid the crowds. From here you have easy access to wineries, Red beach and the Akrotiri Archaeological site with its ancient ruins which were preserved in volcanic ash. There are some beautiful accommodation options here with views of the caldera at about half the price of what you would be paying in Oia. 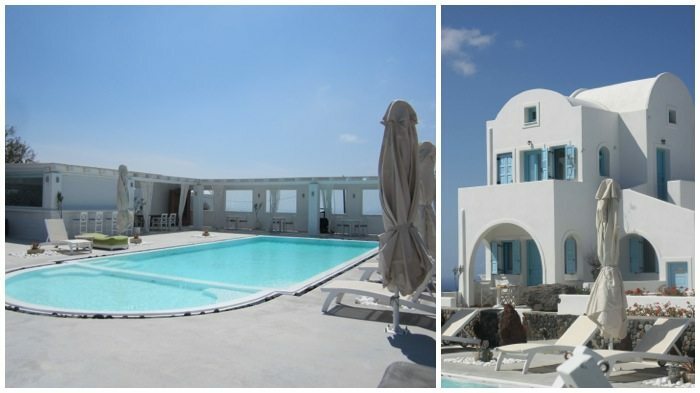 We stayed at Kalestesia Suites a peaceful getaway high atop Akrotiri Hill with 360 degree views of Santorini. 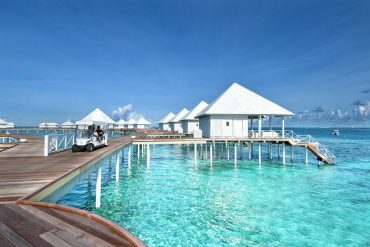 Wonderful staff, balconies or porches with every room, a nice relaxing pool area and a delicious fresh breakfast every morning. Although a bit further out from the action of Thira and Oia it was only a 30-45 minutes drive to get to the other side of the island and there were great views and lots of nice spots to stop and take pictures along the way. We found it easy enough to take day trips to all the different areas with the only downfall being we couldn’t have more than a couple of glasses of wine at dinner when we had to drive back. Be sure to stop at one of the cliff side restaurants on route to Akrotiri. 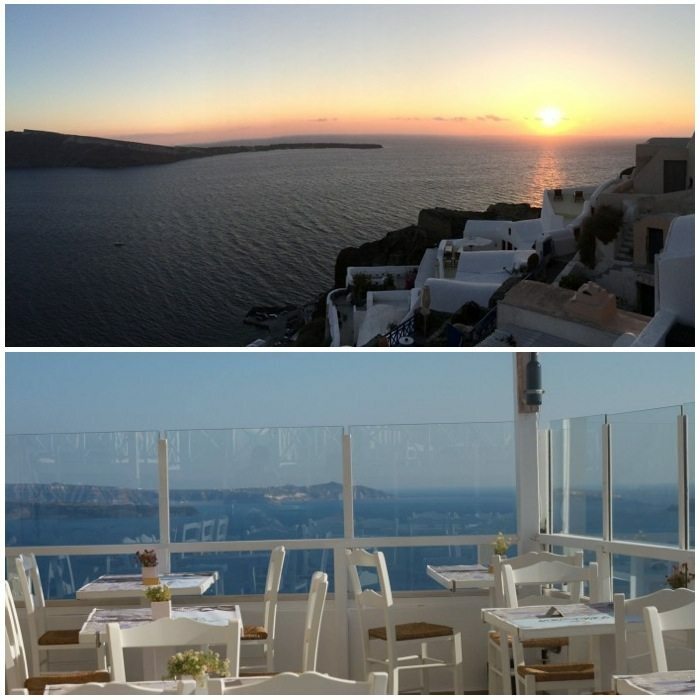 We had our first taste of Mediterranean Seafood at Atlantida Views Restaurant where we dined on BBQ octopus, fish, crab and squid caught fresh that morning and a refreshing Santorini salad. The views from our table really just set the scene. 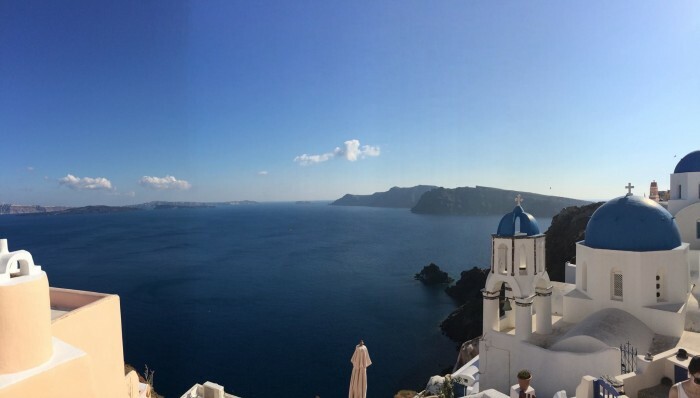 Santorini is a truly magical spot, it’s picturesque and perfect with plenty of activities and sights to explore. 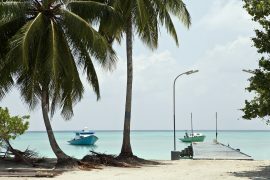 We spent 4 days 3 nights on the island and although it was short we managed to fit in a lot by starting our mornings early and cruising out to different areas of the island each day. 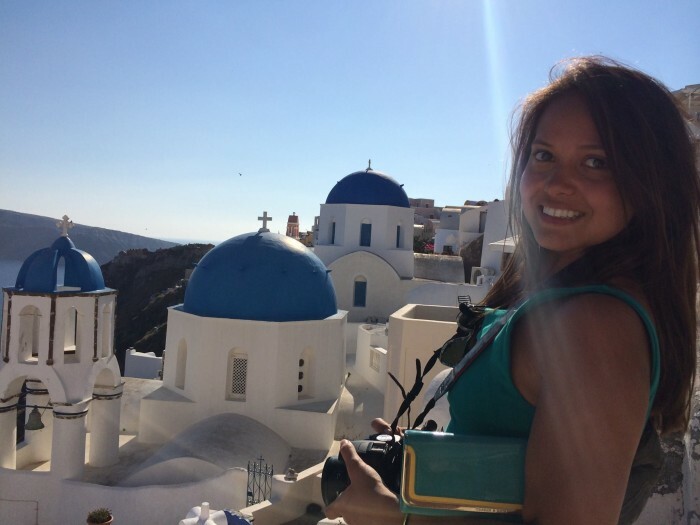 I will keep Santorini on my list of places to come back and explore with no time restrictions and spend my days wandering the island, basking in the sun and living off the local produce and fresh seafood.